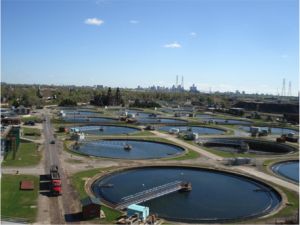 Wastewater treatment systems consist of three different and separate functions: Collection, Primary Treatment, and Solids Treatment. Each separate function – and the infrastructure that supports it – have distinct hazards and require customized approaches to maintain worker and facility safety. Wastewater collection systems consist of complicated networks of sewers, pipes, lift stations and basins. These collection networks are so vast that operators working on these systems are typically required to wear portable gas detection devices for protection and should conform to Confined Space safety procedures. At locations with basins for combined sewer overflow, a Life Safety / Gas Detection system is required to protect the workers and the facility from a buildup or release of flammable gases and toxic gases. Primary treatment is the first treatment step removing approximately half the solids from the wastewater. 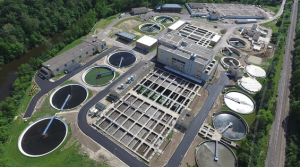 There are numerous processes during primary wastewater treatment where gases can be created and accumulate to dangerous levels including pump stations, screen and grit filtering, aeration decks, and sedimentation processes. Secondary treatment is where solid waste materials are concentrated and treated. Some solids handling processes have resulted in explosions due to an inability to control the build-up of flammable vapors. Scum handling and sludge processes release deadly fumes and raw sewerage lift stations and incineration processes create hazardous gases. The Standard for Fire Protection in Wastewater Treatment and Collection Facilities is published by NFPA as Standard 820. This standard outlines the gas detection and ventilation requirements to protect facilities from Fire and Explosion. These standards strictly apply to flammable liquids and gases that can cause fires or explosions. A system-wide hazard review should be the first step. This hazard review should include interviews throughout the facility to allow the exchange of information from different viewpoints. Every wastewater treatment site is unique and has unique potential for the release and accumulation of fumes due to local geography and climate. Site history should be reviewed in order to quantify the release and accumulation of hazardous fumes. Plant operators should be interviewed to determine dangerous locations and conditions. The possibility of employee exposure to toxic gases, oxygen deficiency, or biological hazards should be reviewed with a special focus on potential equipment failures and the safety impact of a power interruption. Finally, the hazard review should encompass all gas hazards - including gases brought into the facility for the purpose of treating effluent water and fumes created during the collection and processing of wastewater. These gases usually include gaseous sulfur dioxide and chlorine entering the site in the form of cylinders or railcars. Gas detection is required where these gases are stored as well as used. While the two most common hazardous gases created during these treatment processes are methane and hydrogen sulfide, other hazardous gases present include ammonia, chlorine dioxide, hydrogen peroxide, and carbon dioxide. In addition, oxygen depletion can lead to serious injury and even death. Ino-Tek designs, installs and services municipal wastewater treatment plant gas detection systems to protect people and property. To properly maintain a gas detection system at a wastewater treatment plant, resources must be dedicated to regular calibration and routine evaluation of these systems.